Would you like to ask Wikipedia tougher questions than today’s simple keyword searches allow? A prototype plug-in that can do just that will be demonstrated at the World Wide Web conference in Lyon, France, next month. 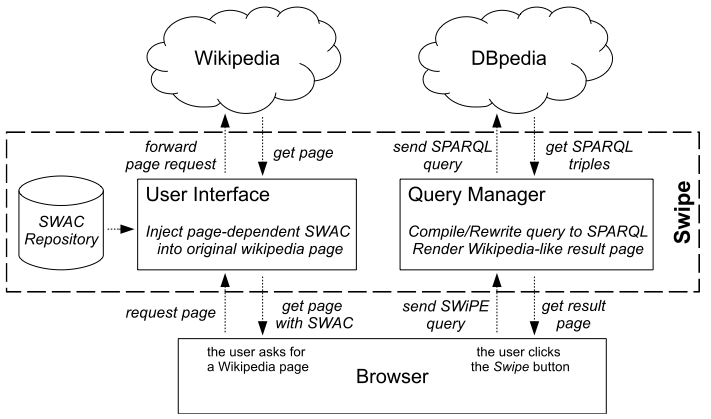 Called Swipe (“searching Wikipedia by example”), the software aims to let users of the online encyclopedia answer complex questions that most search engines would stumble over. For example, trying to figure out “which actresses won academy awards when they were under 30 years old in the last 25 years?” becomes relatively simple when using the program. No knowledge of arcane database query languages is necessary, say the developers. It draws its answers from DBpedia, an expansive collection of 3.6 million data entries harvested from Wikipedia’s pages.